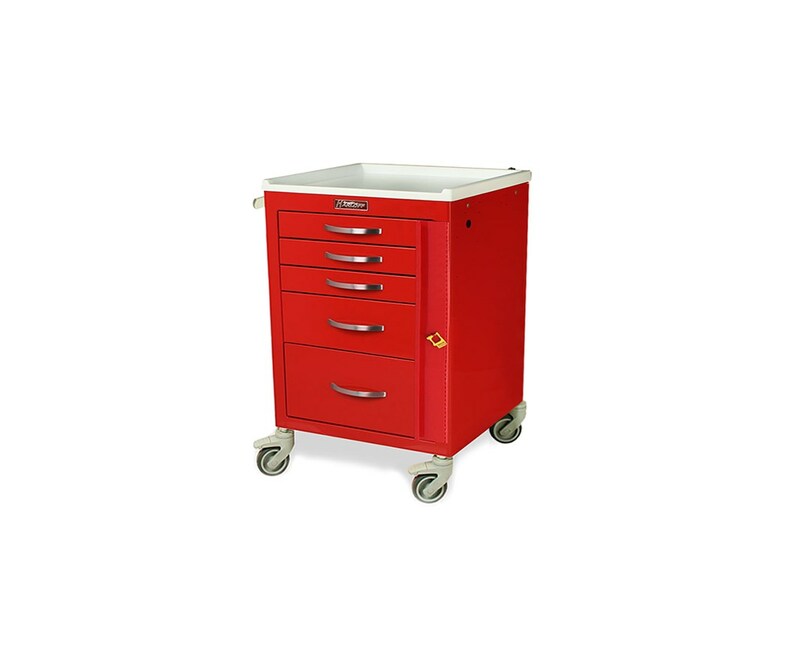 The Harloff Mini Line Short Cabinet Drawer Emergency Cart is a medical storage device and crash cart designed for hospitals or facilities with limited space. Compact and Durable. Constructed only 18" wide, the Mini Line Short Cabinet Drawer easily fits into smaller areas but still provides abundant storage for even the most space-conscious customer. With a durable hard-baked powder coated finish, the Emergency Cart is made of steel and latex-free materials. It features ball-bearing full extension slides, pre-threaded accessory mounting holes, a removable plastic top and a breakaway lock system with an included package of 100 plastic seals. The Mini Line Short Cabinet Drawer comes with a choice of either four drawers or five drawers with 24" vertical drawer space. Hassle-Free Transport. 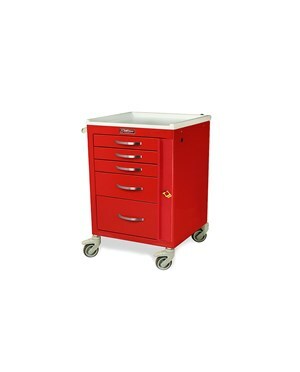 Mounted on sturdy casters, the Short Cabinet Drawer Emergency Cart has a choice of either 3" single-wheel stem full swivel caster system with two that brakes (3144B, 3144E, 3144K, 3145B & 3145B-EMG) or 5" ball-bearing full swivel caster system with one that brakes and one directional (3245B & 3245B-EMG). The 5" caster system has an included Protective Pontoon Side Bumpers for added stability. Drawer Size & Quantity: One - 3", Two - 6", One - 9"
Drawer Size & Quantity: Three - 3", One - 6", One - 9"
Drawer configurations: (3) 3", (1) 6", (1) 9"